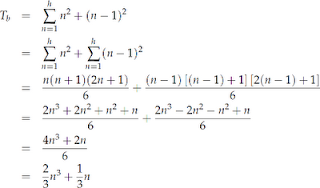 As a young math student I knew tons of formulas and how to use them, but when it came to counting and generalizing sequences of numbers I often had to resort to brute force, or at least guess-and-check. It frustrated me that I knew there should be an easier way to generalize number patterns, but because I could usually get the right answer (patience and accuracy were on my side, thankfully), I didn't force myself to understand patterns more deeply. For my first three years of teaching I used the original CPM series, and in their Algebra (Math 1) text they presented students with three key number sequences: the square numbers, the rectangular numbers, and the triangular numbers. These sequences appear so frequently that knowing and understanding their generalizations can be helpful when the sequences appear explicitly or when they are embedded in the foundation of another pattern. The square number pattern, shown below, is the simplest of the three patterns, although students who are struggling to move beyond a recursive view of the pattern are likely to describe the sequence as "adding the next consecutive odd number." 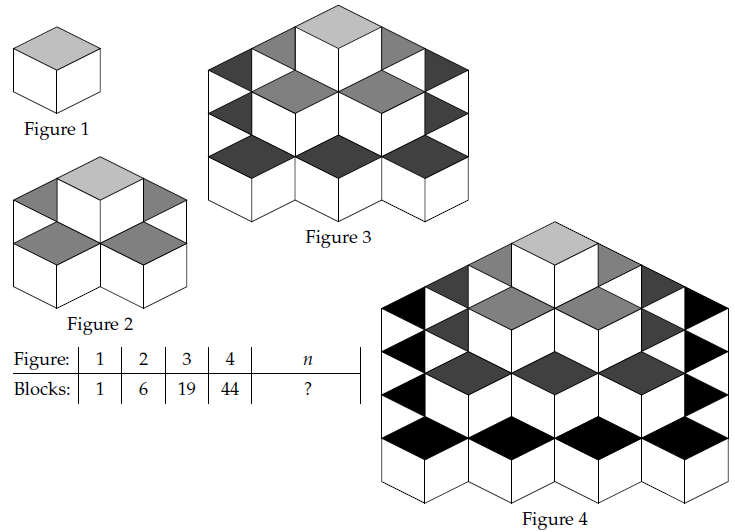 Because of this, the square numbers become a great example for students to see the importance of moving beyond recursive descriptions of patterns and towards expressions that yield the number of tiles for any figure. The rectangular numbers are the next sequence in the progression of patterns. Instead of the expression (or ) as with square numbers, the rectangular numbers use for one dimension. But in fact, the triangular numbers can be seen as half of each rectangular number. This means we can modify the rectangular number expression and represent triangular numbers using . There are real-life representations of the triangular numbers, for sure (bowling pins, stacks of cans or boxes, etc. ), but the real mathematical power behind leading students through this progression is that they see two examples of how to modify a previous pattern and generalization to get a new pattern and generalization. Suddenly our figures jump from 2-dimensional to 3-dimensional, but in doing so we've opened up the strategies students might use to generalize the pattern. If a student looks at how the construction of the tower progresses from figure to figure, he or she may think of the tower as a sum of horizontal layers. If a student were only given the table, or the sequence 1, 6, 15, 28,..., he or she would most likely see the mathematics of the sequence the same way. The progression through the square, rectangular, and triangular numbers certainly makes the skeleton tower more approachable. But what if we build a tower that is more complex? What if our three fundamental number sequences are more hidden, and spatial "flattening" strategies are less apparent? Below is one such possible tower, an extension of the skeleton tower. Unfortunately, after several hours of trying, no generalized expression for the number of blocks in this new tower was found. 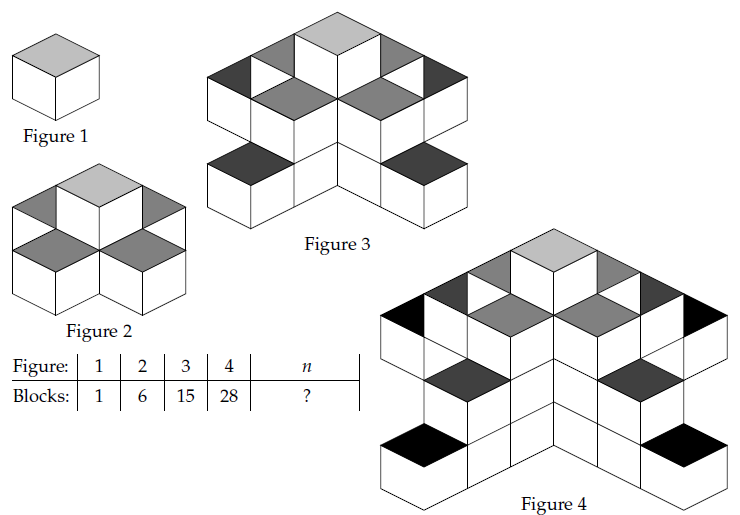 No amount of spatial reasoning would allow me to rearrange the blocks into an easier shape, but fortunately there were two indications that the generalization would be a cubic. 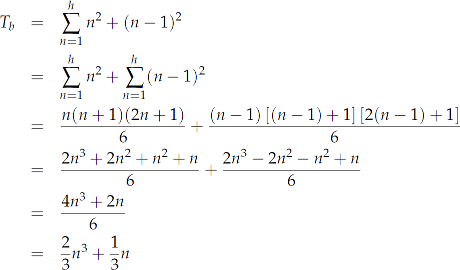 Because the third differences reach a constant term (four), the generalized expression must be a cubic. This patterning of differences is a very handy tool to have in these cases, but I must admit I don't fully understand why it works, or if it can be used as an aid in determining the expression. With no real hope of deriving the generalized expression via non-mechanical means, I gave up and used my calculator to find a cubic regression. The generalized expression for this second cube stack is . (The thirds are there, as I suspected, although that was far more luck than intuition.) Even with this expression I still can't imagine a physical restacking of cubes (or fractions of cubes) that would lead a student to this result, nor would knowledge of square, rectangular, and triangular numbers. I find these five patterns intriguing for a number of reasons. First, we go from very basic to very difficult in a quick but logical way. The skeleton tower is a good choice because it incorporates the triangular and rectangular patterns in its solution, and it adds another dimension (literally and figuratively) that suggests new problem-solving approaches, including 3-dimensional spatial reasoning. As for my pyramid-like tower, I like that it re-establishes a disequilibrium for students (and myself). For Algebra 1 students that aren't ready for quadratic regression, being exposed to such a complex pattern might provide some motivation and could be revisited either later in the course or in Algebra 2. 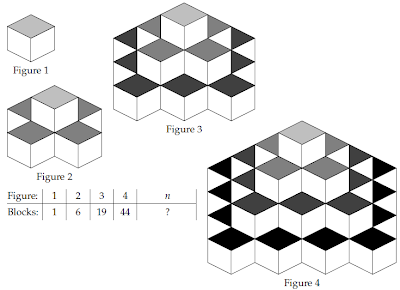 It might also be an example I give to students for a "design-your-own" pattern workshop, where students manipulate different permutations of the square, rectangular, and triangular patterns in 2-dimensional and 3-dimensional shapes. UPDATE (2010.07.02): With great thanks to two friends/followers, I have two more methods of finding the generalization for my pyramidial stack of blocks. @msmathaddict sent a tweet a link to the Dr. Math portion of the Math Forum that filled in my missing step from my pattern of differences. Now that I've seen the solution it seems obvious, but we can use a system of equations to devise the correct degree equation we're looking for. Solving for , we get , so the general cubic becomes .